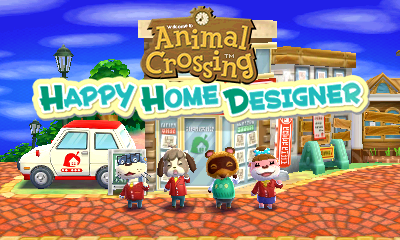 Each day in Animal Crossing: Happy Home Designer offers new events that occur and new features of the game which unlock. The days are not in real-time and the player can advance to the next day at their own pace as they choose, unlike the other Animal Crossing games which run on a real-time clock. Start your career as an interior designer employee of Nook’s Homes by picking your name and customizing your character, and changing into your Happy Home Academy uniform jacket. Then design your very first home by helping out, Lottie, the sea otter and niece of Lyle. She looks for a room themed to the Lovely Series of furniture. This acts as the first tutorial of the game teaching you how to use the game’s designer tools. Start off your second day as a designer by meeting the adorable dog villager Goldie who needs some help with her home design. She’s looking for a house resembling “A forest of books”. When her home is completed, your first emotion will be unlocked: the Happy emotion! Check out our Emotions article for more on emotions. Before doing anything else, Lottie will speak with you and introduce you to to the Client List menu. Using this menu on the touch screen, you can see a list of all the characters which you have designed a home for, view a screenshot of the home, and easily travel to the home again. Using the Client List menu, travel back to Goldie’s complete home you designed in the previous day where she teaches you how to use Animal Crossing Amiibo Cards to invite other characters to another character’s home. After travelling back to Main Street, speak to Lottie in Nook’s Homes, then head back outside to find Lopez who has a home to be designed. He’s looking for “A stylish space” theme. After you’ve picked a villager and designed their home, Lottie will inform you of Tom Nook’s scheduled arrival tomorrow morning. Your day will start off with the first appearance of Tom Nook who will introduce you to Isabelle. After chatting with her, head back outside as you’ll have to wait until tomorrow to build your first public facility with her. Design the villager’s home of your choice and end the day to design your first public fatality the next day. Isabelle will be waiting to speak to you in the morning at the table to discuss the beginning of constructing public facilities in the town. After choosing an exterior theme for the school, head inside to begin designing the school’s interior! The school’s interior is pretty massive in comparison to the homes designed so far, so make good use of all the room! 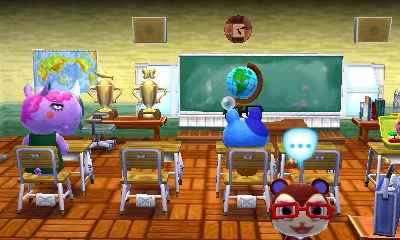 And don’t forget to include at least 4 chairs, 4 tables, and a teacher’s desk to meet Isabelle’s requirements. After completing the school, you’ll get to see a sequence with all four of the Nook’s Homes employees taking a tour before heading back to Nook’s Homes to end the day. Head to the brand new school’s opening ceremony with Isabelle in the morning. After the ceremony, head inside for a quick tour of the school with some villagers. Isabelle will teach you about the new features in public facilities that allow you to change which character fulfills which roles. Head back to Nook’s Homes to meet a new villager Carrie barging into the place with a request for “A garden for kids to play in”. With Carrie comes the unlocking of a new feature allowing you to design the land and exterior around a home in addition to the interior. Use the map provided on the bottom screen to pick a plot of your choice to design Carrie’s home at. Make sure to design both the outside yard and the interior of the home to complete her request. That’s the end of today’s long day! This guide will be updated soon with more days! Stay tuned.